No, he hasn't quit smoking. This just means you're paying for his cigarettes. President Obama is in good health and is tobacco-free, according to a medical report released by the White House. Obama's examination was performed by Navy captain and Physician to the President Dr. Jeff Kuhlman. His assessment of the president's healthy was released Monday. Kuhlman reported that Obama eats well, has a healthy weight, is tobacco free and is physically active. Kuhlman also reported that Obama, "On occasion drinks alcohol in moderation." 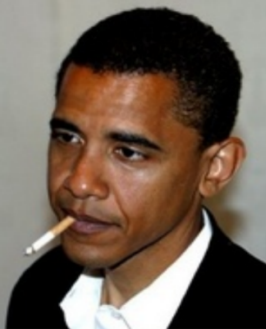 In the past, advisers said that Obama had been working to quit smoking. The media rarely if ever mentions his smoking habit, unless it's a story claiming he no longer smokes. Besides, we've got more urgent concerns like Herman Cain's campaign manager smoking in an ad. Funny how the White House is so eager to release such a report now but still keeps his student records well hidden.